Fig. 1Fourteen Tibetan gilt copper statues with distinctive sculptural characteristics form a hitherto undocumented style group. The statues are now dispersed but may have originally been intended for a specific Tibetan temple. 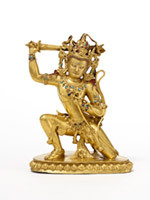 Among the first of the group to be known in the West is the Acala now in the Berti Aschmann Foundation of Tibetan Art at the Museum Rietberg, Zürich (fig. 1). The statue was previously in Belgian and Dutch collections from at least 1974. It was widely published in the 1970s and 1980s as Tibetan, and associated with dates ranging from the fifteenth, sixteenth and possibly seventeenth or eighteenth centuries. In 1995, Helmut Uhlig described it as fourteenth or fifteenth century in On the Path to Enlightenment, the catalogue of the Rietberg Museum’s permanent exhibition of the Aschmann Collection. This paper will argue that the Acala, and indeed the rest of the group, may be dated to the thirteenth century. Fig. 2Another Acala, now in the Lhasa Jokhang (fig. 2), is similar to the Aschmann example in style and iconographic detail. The statues are well modelled with an athletic physique, expanded chest and attenuated waist. The figures stabilize their kneeling posture by extending the left lower leg behind them, with foot poised on the base. Scarf ends falling from the waist fan out in a fishtail as they meet the lotus pedestal. In each case the noose (pasha) twists around the left hand and forms a loop above the left shoulder. Armbands are identical on each sculpture: triangular jewelled elements, with a three-petal lotus design either side of the central gems, are secured by a beaded armlet. Both examples display pronounced upward-fluttering crown ties with fishtail ends, and necklaces with evenly spaced inverted teardrop pendants held by flower petal clasps. This distinctive necklace style and the upward-fluttering crown ties are prevalent on early Tibetan thangkas dating from ca 1150-1250, including a ca 1200 Acala. The Acala thangka features a noose design similar to that in the gilt copper examples, and the scarves and crown ties end in the same distinctive fishtail style. The principal stylistic source of these paintings is the artistic tradition of eastern India in the Pala dynasty (c. 750-1199), and the same Indian influence is evident in these Tibetan statues of Acala. While the sculptural style is influenced by the Pala school, the sculptors themselves may well have been Nepalese: Newar artists were renowned, and much in demand, for finely cast gilt copper sculpture as well as their ability to realise a patron’s particular stylistic preference. Similarities between the two Acala statues extend to an identical lotus form earring style and the colour and shape of the inset stones that adorn the jewellery. The gems on both statues comprise lapis or lapis-coloured glass, turquoise, and glass or crystal that is backed with tinted gold foil to imitate garnet or ruby. Some of the stones on the Aschmann Acala are replaced but the majority are certainly original and correspond in colour and shape to other statues in the style group. 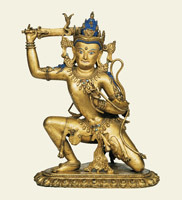 A standing Acala in the Potala (fig. 3) displays similarly coloured jewel settings and a number of the distinctive stylistic characteristics of the kneeling Acalas, including triangular armband shape with the three-petal lotus design of the gem setting, the upward-fluttering crown ties and drop necklace design, the fishtail scarf adjoining the lotus base, the noose passing around the left hand and forming a loop above the shoulder and the tiger skin draped over the right thigh. While the kneeling Acalas wear jewelled helmets the standing Acala has flaming hair, which may reflect iconographic differences between two aspects of the deity. The crown of the standing Acala consists of chakra-like ornaments, a design that is also likely to have iconographic significance. A six-armed Hayagriva in the Jokhang (fig. 4) has a similar chakra-like crown design, as well as the distinctive armband and drop necklace style of the Acala statues, the same color of inset stones and the idiosyncratic fishtail scarf ends. A Vajrasphota formerly in a Swiss collection (fig. 5) has the chakra-like crown and flaming hair style of the standing Acala and Hayagriva, similar scarves with fishtail ends, corresponding tiger skin design and the same drop necklace arrangement as the other statues in the group. 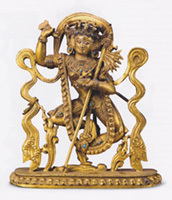 A Vajravarahi offered by Bonhams (fig. 6) wears a billowing scarf with similar fishtail ends as seen throughout the group so far. The colour and shape of the inset jewellery is consistent with the rest of the group. Indeed, the Vajravarahi serves as an exemplar among the style group, with the inset jewellery in virtually pristine condition apart from one replaced red stone in the proper right earring. A small inset silver loop on the inner edge of the severed head necklace (fig. 7) is one of a number of attachments, the rest now missing, that would have secured a string of seed pearls along the full length of the ornament. Small holes interspaced along the necklace indicate the location of the missing silver loops (fig. 8). Similar small holes along items of jewellery are evident throughout the group, suggesting all the statues would have been adorned with strings of pearls. The style and petal shape of the lotus base is consistent throughout the group, but a foliate projection and tang beneath the pedestal of the Vajravarahi suggests that the statue was set into a larger architectural setting. Another Vajravarahi (fig. 9) has had this projection sawn off but is identical in all other respects. The statue was almost certainly made by the same hand as the Bonhams example, and both statues are likely to have been placed together in the same shrine setting. 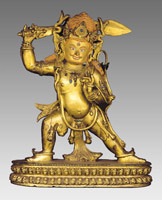 A Vajravarahi formerly in the Philip Goldman collection (fig. 10) exhibits the essential characteristics of this pair of Vajravarahi statues. However slight differences, including flower tendrils that emerge from the base and support the knees, suggest that this example was made by a different hand and was likely to have been placed in a different shrine to the pair of Vajravarahi statues. 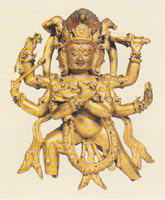 A further Vajravarahi (fig. 11) is stylistically identical to the Goldman example, including the tendrils supporting the knees, but the statue is cast with a free standing lotus pedestal and would thus have been placed in another type of setting. Fig. 12A Chakrasamvara in union with his consort Vajravarahi (fig. 12) displays stylistic characteristics seen throughout the group, including the scarf forming a loop at the shoulder and ending with elaborate fishtail designs, the upward fluttering crown ties, the simple bell and tassel design of the consort’s bone apron as seen on the statues of Vajravarahi, and the distinctive garland of severed heads in relatively low relief, much like the garlands on the statues of Vajravarahi and the Hayagriva. The statue’s original inset jewels are mostly lost; one original garnet coloured foil backed glass or crystal setting remains intact beneath the second skull from the left on Chakrasmavara’s crown, perhaps another uppermost in the setting on the consort’s girdle, but the majority of stones are replacements. The immediate appearance of the statue is thus somewhat different from most of the group, with a predominance of bright blue turquoise and red coral in place of the subtle colour scheme of the original design. However, the style and form of the jewel settings themselves, including the distinctive three-petal lotus design on the armband, anklet and girdle ornaments, remain consistent with the group. Small holes between the beading of the consort’s bone apron and along the edge of the severed head garlands indicate the fixing points of now-lost pearl beading, like others in the group. 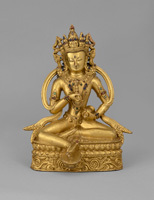 Among the seated deities in the group, a Vajrasattva (fig. 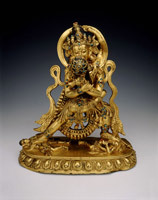 13) bears striking resemblance to the kneeling Acala statues with the same lotus form earring type, similar upward-fluttering crown ties and drop necklace design, identical armband style with triangular projections, and the same sculptural format of broad shoulders, fully expanded chest and attenuated waist. Small holes in the crown band suggest a missing string of seed pearls like the Bonhams Vajravarahi, and the rest of the group. And like the Vajravarahi the lotus pedestal is supported by a frieze of burgeoning lotus stems and buds. The Vajrasattva is a free standing statue but would also have been secured within a shrine by means of a thick tang emerging horizontally from the back of the base, now sawn off (fig. 14). 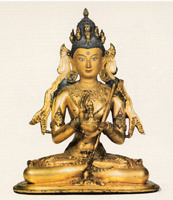 A Chaturbuja Avalokiteshvara (fig. 15) is similar to the Vajrasattva in almost all respects except for some colourful inset stone replacements, notably the bright red coral whose inclusion only highlights the subtlety of the original stone settings throughout the group. Small holes along the crown band and the outside of the necklace confirm that the Avalokiteshvara was also adorned with pearls. A four-armed goddess in the Jokhang (figs. 16) has similar holes along the crown band for the attachment of pearls. The armbands, necklace, fishtail scarf ends, the crown and the fluttering crown ties are comparable to others in the group, but the bracelets resemble the broad bangle design commonly seen in Pala period sculptures and paintings of peaceful female deities, and in early Tibetan works such as the eleventh century Ford Tara thangka. Like the Vajrasattva, the back of the statue reveals a sawn off tang emerging from the base (fig. 17), suggesting the goddess was also secured to a larger shrine setting. And like the Vajrasattva the flat back of the goddess’s base is not gilded. The bases were designed to fit flush within a shrine setting, thus gilding was unnecessary as the sections would be invisible when secured in place by the protruding tangs. 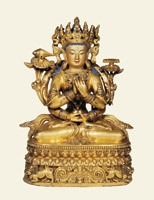 A Nairatmya in the Potala (fig. 18) is the final example in the group to come to light thus far. The sculpture is distinguished by the fishtail ends of the scarves flowing from the neck of the khatvanga and the crown, and the familiar color, shape and design of the jewel settings. Some elements of the jewellery, including the simple five skull crown, the beaded necklace with central jewel setting, and the bell and tassel design at the knee are all remarkably similar to the Vajravarahi statues in the group. This particular combination of ornaments appears to be exclusive to the semi-wrathful goddesses in the group. Small holes for the attachment of a string of pearls are visible along the necklace (fig. 19) as seen throughout the group. The stylistic consistency within this group of fourteen statues suggests they were all made at approximately the same time, and quite possibly for one specific Tibetan monastery. The concept of large scale three dimensional temple mandalas filled with deities in a consistent sculptural style is demonstrated by the gilt copper structures at Densatil. 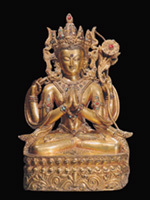 Works from Densatil, commonly dated to around the fourteenth century and generally considered to have Nepalese influence, also afford a convenient comparison with the sculptural style of this group. Densatil figures are predominantly well rounded, flamboyantly modelled and richly embellished with jewel settings. This group follows a rather different aesthetic with emphasis on athletic posture, clean lines and relatively restrained jewel adornments. Comparison between the statues of Vajravarahi in the group and the same iconography from Densatil demonstrate fundamental stylistic variations. Pietro Francesco Mele’s photographs of Densatil in 1948 show dancing dakinis that closely resemble a Vajravarahi in the Seattle Art Museum. The Seattle figure is voluptuously modelled with sturdy limbs, while the dakinis in this group have a more slender line with slim waist and narrow hips. The Seattle Vajravarahi, like all the dakinis visible in Mele’s photographs, has jewel clusters inset with stones hanging from the scarf at either side, while the scarves of this group are unembellished. The Seattle figure’s girdle is encrusted with multiple inset stones, in contrast to the single central gem on the four Vajravarahi statues in this group. The long and ornate bell hangings of the Seattle goddess contrast with the discreet jewel and bell motif at the knees of all the Vajravarahi statues in this group. Elements of practical design also differ. Deities from both groups were attached in their designated positions by means of sturdy tangs emerging from the backs of the statues, which are now mostly all sawn off. At Densatil the tangs emerge from the bodies of standing deities while in this group the tangs emerge from the back of their lotus bases, with the exception of dakinis in both groups that have a tang emerging from beneath the lotus pedestals. Where strings of seed pearls embellish statues they are threaded within beaded channels on Densatil sculpture but merely follow the outline of jewellery items in this group. Thus, the exuberant Nepalese style at Densatil in the fourteenth century is quite distinct from this group of statues that have more in common with the Pala aesthetic seen in early Tibetan painting. Further evidence of their eastern Indian heritage, and perhaps the defining stylistic comparison with the group, is a thirteenth century Central Tibetan Drigungpa Chakrasamvara thangka painted in the Pala idiom, where the vigorous posture and bulk of the krodha deities in the lower register closely correspond to the stance and modelling of the gilt copper statues of Acala, Hayagriva and Vajrasphota (figs. 3, 4, 5). The undulating scarves with pronounced fishtail ends seen throughout the painting echo the movement of cloth depicted in the gilt copper figures. Chakrasamvara’s fluttering crown ties resemble those on the sculptures. The sharply triangular jewelled crown elements of Chakrasamvara and his consort evoke the armband shape of statues in the group. The manifest stylistic similarity to thirteenth century Pala style Tibetan painting, and in particular the Chakrasamvara and other early Drigungpa paintings, thus provides compelling evidence for a similar thirteenth century date for this group of statues. 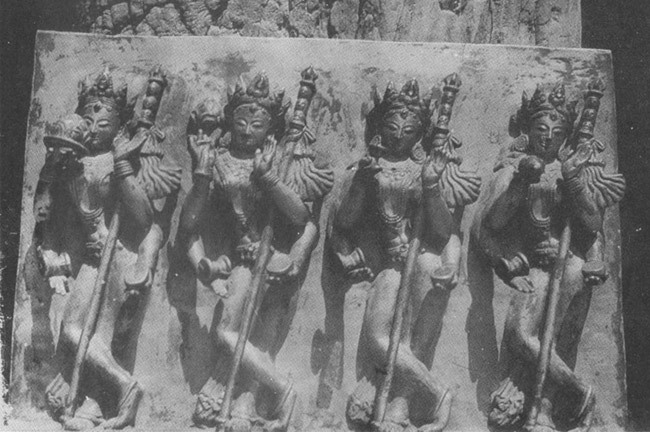 A photograph taken by Mele at Tsetang in 1948 depicts a cast and gilded copper alloy panel inset with gems depicting four-armed offering goddesses (fig. 20). The sculptural style is related to the group of fourteen statues. The reproduction is not clear enough to confirm whether the panel is from precisely this group, but it is certainly stylistically related and of the same thirteenth century date. The goddesses are modelled in a similar attenuated style to the Vajravarahi statues in the group (figs 6, 9, 10, 11). The inset jewellery design is similarly restrained, with a single crystal/glass at the centre of the necklaces and a single stone setting on the girdles. The khatvanga sceptres are similar, with scarves forming large fan shapes at the side. The panel is photographed in an isolated location against what appears to be an ancient wooden pillar. It is not known if there were more panels at Tsetang completing a series of offering goddesses, or whether the panel originated in Tsetang. The style would certainly seem to preclude a Densatil provenance. The more flamboyant Densatil style is markedly different, as described above. Moreover, the photograph was taken at Tsetang before the destruction of Densatil, which suggests that the panel was unlikely to have ever been at Densatil. The format however does indicate that its original function would have been much like the offering goddess panels at Densatil that were separately cast and fitted together to form a larger structure. The function of the panel thus confirms that large scale structures cast in numerous parts were already in use to decorate Tibetan temple interiors in the thirteenth century, in much the same format as the monumental gilt copper alloy structures at Densatil in the fourteenth century. Indeed, a tashi gomang stupa at the Kagyu monastery of Drigung (f. 1179), thought possibly to be the model for those at Densatil, is described by Sherab Jungye (1187-1241). The stupa must therefore have been built before the death of Sherab Jungye in 1241, and was probably lost in the destruction of Drigung in 1290. Many of the statues in the present group of thirteenth century gilt copper sculptures—which bear close stylistic comparison to thirteenth century Pala style Drigungpa painting—retain tangs, or remnants of tangs, that would have secured their position in just such a monumental structure. Whether this structure was at Drigung or at another now lost location, it is not known. But it is now certain that Densatil was not the only monastery in Tibet to have built such fabulous funereal structures, as the surviving thirteenth century sculptures discussed in this article make clear. The Aschmann Acala (fig. 1) has a Tibetan inscription along the lower edge of the lotus pedestal that states that it was the personal image of Dharma Lord Nam Tempa of Sangphu, and that the statue was housed in the main chapel of Sangphu. Monastery archives record that Namkaï Tempa from Tsetang held the seat of the Upper College of Sangphu during the fifteenth century, and it is likely that Namkaï Tempa was indeed the Dharma Lord Nam Tempa mentioned in the inscription. The line of script however is crudely etched rather than properly incised and cannot be considered contemporaneous with the creation of the statue. As the inscription was added well after the statue was made it only records its use in one moment of the Acala’s history. Although the statue may have been at Sangphu for some period of time it is by no means certain that it was originally designed for that monastery when the sculpture was cast in the thirteenth century, just as it is unlikely that all the statues currently catalogued by Ulrich von Schroeder in the collections of the Potala, the Jokhang etc were all necessarily in those collections prior to the Cultural Revolution, or other upheavals during the often turbulent histories of Tibetan monasteries. The deity is described as being the Immovable One (Tib. mi g.yo ba), the Tibetan translation of the Sanskrit name Acala, in accordance with the iconography. The inscription indicates that the deity was a tutelary god (Tib. mgon) whose representation had been used as a personal meditational image (Tib. thugs dam); a term referring to a formal pledge (Tib. thugs kyi dam bca’) towards the spiritual realisation of a particular deity by a Buddhist practitioner. The nature of this sacred bond leaves open the question of whether the statue had been commissioned by the latter, as it would often have been the case. The last section of the inscription records another moment in the life of this object. It states that the gilded bronze was then housed in the main shrine room or temple (Tib. mchod khang) at Sangphu Monastery. The eminent monastery of Sangphu Neutok (Tib. gSang phu ne’u thog) is relatively well documented. [1a] Located about fifteen kilometres southwest of Lhasa, it was established in 1073 by Nok Lekpe Sherab (Tib. rNag Legs pa’i shes rab), one of the most prominent disciples of Atiśa. The image is said to have belonged to a Buddhist master from Sangphu who is reverentially addressed as ‘Dharma Lord’ (Tib. chos rje); a title generally reserved for high lamas. The abbatial succession records of that monastery suggest that the owner of the statue would have been Namkha Tenpa from Tsetang (Tib. rTses thang pa Nam mkha’ brtan pa); his name, however, appears in a shortened form in the commemorative inscription (i.e. Nam brtan ba). Little is known at present about Namkha Tenpa who occupied the abbatial seat of Ling Tö (Tib. gLing stod), the Upper College at Sangphu, in the fifteenth century. After the death of Chapa Chökyi Senge (Tib. Phywa pa Chos kyi seng ge) in 1169,[2a] the renowned establishment was reorganised into two distinct colleges; namely the Upper and Lower Colleges. Both of them, in turn, were composed of several collegiate schools (Tib. grwa tshang) adhering mainly to the Gelugpa and Sakyapa traditions of Tibetan Buddhism. It is believed that the abbatial line of the Upper College started around 1185. [3a] While it is not possible to specify to which collegiate school Namkha Tenpa belonged, he is listed as having been the Twenty-eighth Abbot in the abbatial succession of the Upper College. [4a] Textual sources indicate that Namkha Tenpa succeeded Rinchen Jangchup (Tib. Rin chen byang chub), whose tenure lasted for seven years, during which time the famous Blue Annals (Tib. Deb ther sngon po) were completed in 1476. [5a] It is therefore possible to surmise that Namkha Tenpa’s tenure was exercised after this date, at some point during the last quarter of the fifteenth century. In view of the above, the Acala image must have been donated to the monastery presumably after Namkha Tenpa’s demise. It was eventually placed inside the main temple of Sangphu Monastery, whilst an inscription honouring his former owner was added unskilfully. Fig. 1a – Tibetan inscription incised on the lower half of the Rietberg Acala, Zürich. Photo: Laurent, 2015. Fig. 2a – Scratched surface and abraded section reading gsang phu’i chos rje nam. Photo: Laurent, 2015. Fig. 3a – Noticeable difference in hue between gilded lotuses and lower edge. Photo: Laurent, 2015. The principal stylistic source of these paintings is the artistic tradition of eastern India in the Pala dynasty (c. 750-1199), and the same Indian influence is evident in these Tibetan statues of Acala. 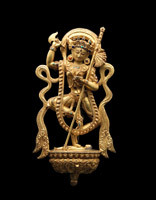 While the sculptural style is influenced by the Pala school, the sculptors themselves may well have been Nepalese: Newar artists were renowned, and much in demand, for finely cast gilt copper sculpture as well as their ability to realise a patron’s particular stylistic preference. 9: Ian Alsop has pointed out in a personal communication that Acala is an epithet for a number of deities including Vighnantaka and Chandamaharoshana. More precise identification of the gods depicted in the statues described here as Acala could help establish the original iconographic program of the whole group. See also Amy Heller, “On the Development of the Iconography of Acala and Vighnantaka in Tibet”, in Embodying Wisdom: Art, Text and Interpretation in the History of Esoteric Buddhism, Rob Linrothe and Henrik H. Sørensen, eds., Copenhagen: Seminar for Buddhist Studies, pp. 209-228. 25: Records suggest that there was temple construction at Densatil both before and after the fourteenth century, but the widely published photographs by Mele depict what is probably the fourteenth century phase. Ian Alsop has noted that some of the gilt copper panels in this style, that were recovered from the destruction of Densatil during the Cultural Revolution, have inscriptions in Newari indicating their location, confirming that Nepalese artists were at least involved in this fourteenth century phase of construction. 1. Armand Neven, Le Tantrisme dans l’art et la pensée, Brussels, 1974, p. 74. Armand Neven, Lamaistic Art, Brussels, 1975, cat. no. 27. Gilles Béguin, Dieux et démons de l’Himâlaya, Paris, 1977, p. 150, cat. no. 144. Ulrich von Schroeder, Indo-Tibetan Bronzes, Hong Kong, 1981, p. 435, pl. 115D, E .
2. Helmut Uhlig, On the Path to Enlightenment, Zurich, 1995, p. 173, cat. no. 116. 3. Ulrich von Schroeder, Buddhist Sculptures in Tibet, Hong Kong, 2001, Vol. II, p. 1039, pl. 259C. 4. Steven Kossak and Jane Casey Singer, Sacred Visions, New York, 1998, pp. 50-127, cat. nos. 1, 3, 4, 13, 22, 23, 25, 31. 6. Steven Kossak and Jane Casey Singer, Sacred Visions, New York, 1998, pp. 32-40. 7. 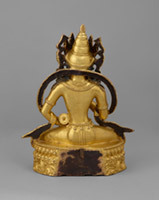 Compare an 11th century eastern Indian gilt copper Buddha at Mindrolling with broad shoulders, fully expanded chest and the attenuated waist typical of eastern Indian sculpture of the period, and adorned with a necklace of inverted teardrop pendants with flower petal clasps, and a crown tied with elaborately fluttering scarves, see von Schroeder, Buddhist Sculptures in Tibet, Hong Kong, 2001, Vol. I, p. 265, pl. 84C. 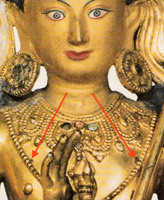 Compare also the triangular stone set armbands, drop necklace design and subtle colour scheme of the inset gems of an 11th or early 12th century Pala period Amitabha in the Potala, von Schroeder, Buddhist Sculptures in Tibet, Hong Kong, 2001, Vol. I, p. 253, pl. 79A. 8. Ulrich von Schroeder, Buddhist Sculptures in Tibet, Hong Kong, 2001, Vol. II, p. 1038, pl. 259A-B. 10. Ulrich von Schroeder, Buddhist Sculptures in Tibet, Hong Kong, 2001, Vol. II, p. 1070, pl. 275A. 11. Pratapaditya Pal, Himalayas: An Aesthetic Adventure, Art Institute of Chicago, 2003, p. 147, cat. no. 96. N.B. the central chakra of the crown is replaced. The form of the original might have been more like the central chakra crown leaf of the Hayagriva, Fig. 4. For condition before restoration see Sotheby’s New York, June 4, 1994, lot 23. 12. Bonhams New York, 13 March 2017, lot 3035. 13. Traditionally pearls are strung on silver wire held in place by silver loops. Fragmentary evidence of this is seen throughout early Tibetan and Nepalese sculpture, such as the anklet on the left foot, just above the heel, of a 14th c. Parnashavari, probably from Densatil, see Olaf Czaja, Adriana Proser, eds, Golden Visions of Densatil, Asia Society, New York, 2014, p. 121, cat. no. 24. 14. The upper tier of the structure supporting a tashi gomang stupa at Densatil had figures of Vajravarahi attached by a similar projection, see Olaf Czaja, Adriana Proser, eds, Golden Visions of Densatil, Asia Society, New York, 2014, p. 165, fig. 35. 15. Sotheby’s New York, September 21, 1995, lot 48. 16. cf. the numerous statues of Vajravarahi adorning a single shrine at Densatil, see Olaf Czaja, Adriana Proser, eds, Golden Visions of Densatil, Asia Society, New York, 2014, p. 165, fig. 35. 19. Ulrich von Schroeder, Buddhist Sculptures in Tibet, Hong Kong, 2001, Vol. II, p. 1041, pls. 260B-C.
20. cf. Ulrich von Schroeder, Buddhist Sculptures in Tibet, Hong Kong, 2001, Vol. I, p. 290-1, pls. 96A-F.
21. Kossak and Casey Singer, Sacred Visions, New York, 1998, p. 55, cat. no. 3. 22. Ulrich von Schroeder, Buddhist Sculptures in Tibet, Hong Kong, 2001, Vol. II, p. 1047, pls. 263C-E.
23. 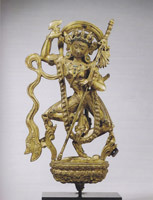 The specific jewellery combination suggests that the sculpture represents a female deity rather than a rare aspect of Padmasambhava as proposed by von Schroeder, Buddhist Sculptures in Tibet, Hong Kong, 2001, Vol. II, p. 1047, pls. 263C-E. The attributes of kartrika, kapala, and khatvanga correspond with the iconography of Nairatmya. 24. Olaf Czaja, Adriana Proser, eds, Golden Visions of Densatil, Asia Society, New York, 2014. 25. Records suggest that there was temple construction at Densatil both before and after the fourteenth century, but the widely published photographs by Mele depict what is probably the fourteenth century phase. Ian Alsop has noted that some of the gilt copper panels in this style, that were recovered from the destruction of Densatil during the Cultural Revolution, have inscriptions in Newari indicating their location, confirming that Nepalese artists were at least involved in this fourteenth century phase of construction. 27. A Vajrakila, probably from Densatil, retains the tang, see Christie’s, 19 March 2013, New York, lot 330, where the end of the tang is visible in the catalogue illustration above the undulation of the scarf on the right. 28. According to what can be established through study of photographs, and physical examination of the objects where it has been possible. 30. Jeff Watt, https://www.himalayanart.org/image.cfm/65205.html, https://www.himalayanart.org/image.cfm/81410.html. 31. Giuseppe Tucci, To Lhasa and Beyond: Diary of the Expedition to Tibet in the Year MCMXLVIII, New Delhi, 1983, first published 1956, ill. opp. p. 131. 32. A complete set of sixteen offering goddesses is seen in the lower register of an early fourteenth century painting of Chakrasamvara, and on gilt copper alloy panels from Densatil, see Olaf Czaja, Adriana Proser, eds, Golden Visions of Densatil, Asia Society, New York, 2014, pp. 114-17, cat. nos 20-22. 35. Michael Henss, The Cultural Monuments of Tibet, Munich, London, New York, 2014, Vol. I, p. 278. 38. The inscription has more recently been partially erased, but the inferior quality of incising can be judged from the right hand end of the line of script where the characters have not been abraded. 39. Ulrich von Schroeder, Buddhist Sculptures in Tibet, Hong Kong, 2001. 1a. Karl-Heinz Everding, ‘gSang phu Ne’u thog, Tibet’s Earliest Monastic School (1073): Reflections on the Rise of its Grva tshang bcu gsum and Bla khag bcu’, Zentral-Asiatische Studien, International Institute for Tibetan and Buddhist Studies - Andiast, no. 38 (2009): 137–54. 2a. Chapa Chökyi Senge (1109–1169) was the Sixth Abbot of Sangphu Néutok monastery for eighteen years. 3a. Leonard van der Kuijp, ‘The Monastery of the Gsaṅ-phu Ne’u-thog and its Abbatial Succession from ca. 1073 to 1250’, Berliner Indologische Studien, no. 3 (1987): 113. 4a. Shunzo Onoda, ‘The Chronology of the Abbatial Successions of the Gsaṅ phu sne’u thog Monastery’, Wiener Zeitschrift Für Die Kunde Südasiens, no. 33 (1989): 212; Shunzo Onoda, ‘Abbatial Successions of the Colleges of gSang phu sNe’u thog Monastery’, Bulletin of the National Museum of Ethnology (Osaka) 15, no. 4 (1990): 1064, 1067. 5a. Onoda, ‘The Chronology of the Abbatial Successions of the Gsaṅ phu sne’u thog Monastery’, 212.